July 29, 2010 by Ken Ward Jr.
Massey Energy has filed a politically motivated civil suit, also known as a Strategic Lawsuit against Public Participation (SLAPP) suit, against fourteen activists arrested last year in relation to a protest on a mountaintop removal mining site. The suit seems to be part of a larger strategy on the part of the mining company to intimidate and silence critics of the company’s safety record and controversial mining practices, particularly mountaintop removal coal mining. Climate Ground Zero says Massey has already filed four such suits against activists who have taken part in peaceful civil disobedience protests against the company’s mountaintop removal mining operations in Southern West Virginia. I’m aware of several court orders meant to block these protests, including this one in state court and this one by U.S. District Judge Irene Berger. 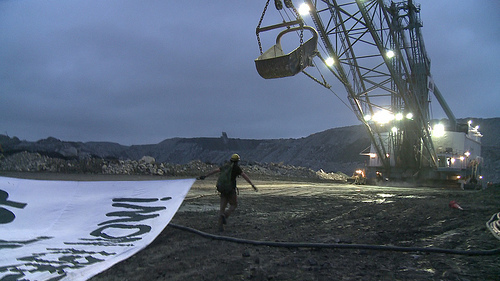 The latest of the suits targets those who took part in this protest shutting down a dragline mining machine. Commonly used to exhaust critics by burdening them with the cost of a massive legal defense, SLAPP suits have been banned by at least 26 states and one territory has protections against SLAPP suits. West Virginia does not have a ban, but its courts have adopted some protections against them. The release then cites a case concerning SLAPP suits in West Virginia. Now, Massey has sought (and in some cases received) somewhat broad court orders against these protests. But in general, my reading of the suits is that Massey wants the courts to order folks to stop trespassing on their mining sites. That’s quite a different sort of situation than the one outlined in the court case cited by Climate Ground Zero, where a citizen was sued for standing up at a Weirton City Council meeting and criticizing a public official. You are right that this is not a typical SLAPP suit. It is a tort claim seeking unspecified damages resulting from our action over the past year and a half. We are offering an affirmative defense, and will argue that our actions were necessary to prevent an imminent, illegal and irreparable harm to to the public interest. Climate Ground Zero is not a party to this suit and the defendants can call it what they want, but we will still argue that the court injunction is over broad and unconstitutional. Thanks, Mike. I appreciate your comments. My only thought was in raising the question of whether the sort of direct action, peaceful civil disobedience that has been carried out against mountaintop removal operations would be considered by the courts to have the same sorts of First Amendment protections that were the grounds for the SLAPP suit rulings in the cases mentioned in the Climate Ground Zero site. I don’t know that a judge is going to rule that trespassing is protected activity, as compared to speaking out at a city council meeting. One can obviously argue the comparative merits of those two types of actions, but whether they have the same First Amendment protection was my question. Thanks. I am talking to the lawyers involved, who are new to this type of case. You are correct that Climate Ground Zero is not claiming First Amendment protection for the protests. We argue necessity. While one might argue that sitting in front of a bulldozer is speech, chaining oneself is an action. Still, the fact that I received two convictions for contempt of court for allegedly recruiting Tom Smyth and Joe Hempsher shows that we are being penalized for speech related activities. We are appealing this, and the imposition of my sentence is being delayed until the West Virginia Supreme Court rules on our appeal. Trespassing would only be protected if we are allowed to show that we meet the tests for necessity. Those are: That a crime was in progress; that all other avenues to address this situation were exhausted; that our crime was less than the one we are intervening in; and that we had a reasonable belief that out actions could succeed. It is not likely that the Judges in our four civil actions will allow us to formally present this defense and call the appropriate witness, but this is exactly what we plan to do. A coal mine is not as safe a location as say a public sidewalk. Who is responsible if a protester is killed on a mine site? Entering a mine site without proper training is tantamount to suicide. Not so. No one is saying a strip mine is public property. We are saying its a crime scene. There are risks involved even with demonstrations on a sidewalk, but our safety record is a whole lot better than Massey’s. In 35 years I have never organized a demonstration where anyone was injured. In fact, the miners have been very respectful on the mine site, and we work together with law enforcement to reduce the risk to both miners and demonstrators. I greatly admire Mike Roselle and the other Climate Ground Zero activists. One of the tests for the necessity defense is that all other avenues to address this situation were exhausted. Organized citizens have been fighting the illegalities and the extreme effects of MTR on humans and the environment for almost fifteen years now. OVEC held its first public forum on MTR in 1996, at Marshall University. We and others have been working in every way possible – short of civil disobedience – to bring this injustice to an end. And still it continues. I lack the courage to do what Mike and others are doing, and I am humbly grateful to them. Perhaps you or some of the attorneys working with the protesters could post citations or links to cases that outline this “necessity” defense. I know I would be interested to understand more about this legal issue. I’ll look, but I don’t know whats out there. We are in uncharted territory. But I can certainly lay out our defense, and indeed believe I already have. I’ll post something tomorrow. (1) they were faced with a choice of evils and chose the lesser evil; (2) they acted to prevent imminent harm; (3) they reasonably anticipated a direct causal relationship between their conduct and the harm to be averted; and (4) they had no legal alternatives to violating the law. For whatever it’s worth, I think this is a bit of a different concept that what was articulated in the SLAPP suit rulings cited in the Climate Ground Zero news release, which found a First Amendment right to do things like comment about a government official at a city council meeting. I can’t find the document but you could look up Willamette Industries vs Cathedral Forest Action Group, No.84-1039 (Cir. Ct., Linn County, Ore.,Dec. 5, 1985) if you have access to a legal data base. I was consul for CFAG at the time and argued the case pro se along with several other attys. We had a two day hearing where we were allowed to present evidence on the balance of harms and call witness without a jury present. The Judge ruled against us, however, and we were not allowed to present a necessity defense in front of the jury, which found us all guilty. Still, the jury foreman stated that they had wanted to acquit us, but chose to follow the judges instructions. If we had been able to present our defense, perhaps the outcome would have been different. The judgment was for just under a $100,000 and has since been settled for a smaller amount. Anyway, Climate Ground Zero has never asserted a First Amendment Right to intervene in illegal mining operations. And we agree with the Plowshares position as it applies to nuclear weapons, and that it should also apply to climate change, which we also see as a moral issue. A more recent case in England, http://www.guardian.co.uk/environment/2008/sep/10/activists.carbonemissions is a good example of our strategy, and in this case James Hanson was able to testify on the dangers of burning coal in the trial of six Greenpeace activist who had scaled a smokestack on a power plant in Kingsnorth. The activist were acquitted. It is clear at least in Raleigh and Boon County the judges are unlikely to allow us to use the necessity defense. Judge Burnside has already ruled on this when we tried unsucessfully to put Bo Webb on the stand in order to testify of the dangers he and his family faced from the blasting up Clays Branch in Naoma. Shortly after Climate Ground Zero shut down the blasting for a day, the EPA filed four Notices Of Violation and shut the operation down until they could remove the debris and fly rock that had been deposited outside the permit area. Here we have proof of illegal and dangerous activity by Massey, and clear evidence from Bo that our actions had made a deference with the EPA, yet we are not allowed to discuss it in court. So we go into court against Massey’s lawyers with one hand tied behind our backs. Yet we need only one juror to prevail. So I will take my chances, because I know there are many West Virginians who view Massey as a “criminal enterprise”, as Robert F. Kennedy has often referred to them. Judges and Prosecutors like to focus on the fact that it is most often different individuals who are writing the letters and attending the meetings than those who are brave enough to put their bodies and freedom on the line for what they believe in. A movement cannot progress without each role being filled, often by different individuals. If a person who chained themselves to a bulldozer had not attended the obligatory public meeting (held years before the person had heard about the injustice), and had not petitioned their congressional representatives and the President regarding the matter, then they have not individually exhausted all potential remedies short of civil disobedience. This is what every judge I have ever heard say when addressing the use of the necessity defense. They pretend that it may have taken just one more letter to a Senator to bring the injustice to an end, that one more person standing up at a meeting may have swayed the decision makers, who had made their decision years before the meeting ever took place. Not saying don’t try and use the necessity defense but just be ready for that argument. Perhaps y’all can break some new legal ground in West Virginia since folks have been building the opposition for 15 years.